A SOUTH Carlow community remembered and celebrated one of its much-loved characters on New Year’s Day this year. The annual New Year’s threshing in Rosdillig, Borris has been taking place on the lands of Anna and Philip Whitford over the past decade. This year’s event was particularly poignant as popular local man and keen thresher Mick McCormack passed away on St Stephen’s Day after taking ill suddenly. The 67-year-old was known for his involvement in Rosdillig Steam Rally and was described as ‘The Threshing Man’. 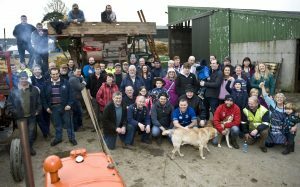 The first threshing of 2019 which took place on New Years day on the lands of Phillip and Anna Whitford at Rosdillig, Borris Photo Roger Jones. “Ask him to do anything when the threshing was going on or the rally and he’d do it. Mick was in the middle of it, that was his life,” said Anna. After his passing, organisers questioned whether the event should go ahead. Mick’s vintage machine was used on the day and a group of friends toasted their dearly missed colleague. There was, of course, plenty of food and drink and festivities stretched into the late hours, providing an invigorating start to 2019.